Powers/Abilities: Mather powers' origin are unknown (probably they were granted to him by the Dark Rider). Mather could sense and find magic beings, project his voice (or thoughts) at very long distances, control and command other's will by touching them or hitting them with the fire shot from his wooden cross. Mather seemed stronger than a normal human. Mather used a wooden cross as weapon. The cross could shoot a "purifying" fire, not burning things, but strong enough to hurt Spider-Man and drive the Vision off. The fire also allowed him to control Scarlet Witch's will. History: (Marvel Team-Up I#44 (fb) - BTS) - At an unspecified time, Mather was a seeker of beings gifted with magic powers. The Dark Rider (a powerful magus of a pre-historic Era) found him, plagued him, and forced him to serve for his own purposes: to find people with magic powers to feed of their power. (Marvel Team-Up I#42 (fb)) - The fanatic Cotton Mather started his mission for the Dark Rider. He arrived at Salem, Massachusetts in the Winter between the 1691 and the 1692 with the purpose of increasing the fear of witchcraft in people in order to find real witches (or to cover the Dark Rider activities). Mather increased the fanaticism of Salem's people , had the Reverend John Burroughs killed by hanging, and fomented the witchhunt. (Marvel Team-Up I#41 - BTS) - Cotton Mather traveled in the 20th century (probably helped by the Dark Rider) to the Castle of Doom in Laveria. With his "voice" he attracted the Scarlet Witch to the Castle and captured her. (Marvel Team-Up I#41) - Spider-Man was transported to the Castle by a Scarlet Witch's spell. He tried to stop Mather, but was defeated by his "fire" and by the Scarlet Witch, controlled by Mather. Mather used Dr. Doom's Time Machine and brought Wanda back to 1692 where he exposed her to a public pyre. (Marvel Team-Up I#41 - BTS) - The Dark Rider started to absorb Scarlet Witch's magic powers. (Marvel Team-Up I#41) - During the execution Mather was assaulted by Vision and Spider-Man, who had followed him to Salem using Doom's Time Machine. (Marvel Team-Up I#42) - The crowd overpowered Spider-Man and Scarlet Witch, and Cotton Mather knocked the Vision down with his "cross-fire". The heroes were imprisoned. Spider-Man and Vision freed themselves. Mather met the Dark Rider in the wood near Salem. The two were assaulted by Spider-Man and the Vision. Dr. Doom arrived on the scene attracted by Dark Rider's power and the foolish Mather greeted the coming of the Avenging Angel. (Marvel Team-Up I#43) - Cotton Mather saw the Angel of Light in Dr. Doom, come to fight the darkness in Man and declared himself servant of the new "master". Mather asked Doom to show him the way of the Light and to be taught how to cleanse the world from evil. Dr. Doom hurled him away. The Dark Rider absorbed more power from the heroes and in particular from Dr. Doom's latent black magic powers and managed to defeat him, the two Avengers, and Spider-Man. (Marvel Team-Up I#44) - The Dark Rider set up machinery to absorb the powers from the four heroes. He thanked Cotton Mather for his optimal service. Then Mather was forced by him to take the Soul Blade, a shining knife, to be used to kill the heroes and to transfer all their power to the Dark Rider. Mather was about to stab the Scarlet Witch, but was stopped by Moondragon, transported there by Wanda's last spell. Moondragon held the Dark Rider for the right time to let the other heroes awaken and fight together against the demonic menace. The heroes defeated the Dark Rider who burnt into cinder in front of Cotton Mather's eyes. Cotton Mather went mad. His mind could not bear the events of that night. 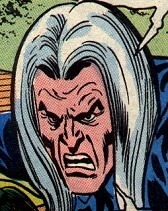 (Marvel Team-Up I#45) - Cotton Mather, now mad, screamed while Spider-Man left the 17th century on the Time Platform. (Marvel Team-Up I#44 (fb) - BTS) - Cotton Mather tried to tell the history of the Dark Rider and of the battle he attended, but no one believed him. He was believed insane. Comments: Created by Bill Mantlo, Sal Buscema and Mike Esposito/Dave Hunt. The aliases "Great Inquisitor" and Hatemonger only appear as titles of Marvel Team-Up I#41 and #42, respectively. It's not clear if Cotton Mather belonged to the 1691. The Dark Rider claimed that he sent Mather in the 17th century to find persons with magic powers but that Mather performed this activity yet, at his (Mother's) time, and he was his emissary "of the future" (I think Cotton Mather comes from a past before 1691). Obviously Cotton Mather and John Burroughs are both actual historical people who existed in the real world. Cotton Mather's fate wasn't as bad as it was described in MTU I#44-45. Yes, his reputation did suffer somewhat because of his involvement in the Salem Witch Trials but he was never considered mad and he went on to live a fairly respectable life. As for George Burroughs, Cotton was instrumental in his hanging but not as dramatically as portrayed in MTU I#42. When some of the onlookers called for the execution to be stopped after Burroughs recited the Lord's Prayer, Mather intervened by reminding them that Burroughs had been duly convicted and reassured them that Burroughs was guilty. Cotton Mather (1663-1728) was the son of Increase Mather and grandson of Richard Mather and John Cotton. He entered Harvard with 12 and graduated B.A. in 1678 and M.A. in 1681. Ordained in 1685 he became a colleague of his father at North Church, Boston and served as a pastor in his father's abscence and after his father's death in 1723. His writings made him one of the most celebrated New England Puritan ministers. After his involvement in the Salem Witch Trials he helped to make New England a cultural center. He was one of the moving spirits involved in the founding of Yale and the first native-born American to be a fellow of the Royal Society. He persuaded Zabdiel Boylston to inoculate against smallpox. Info taken from All Infoplease Almanacs. Would the right Burroughs please stand up? Bill Mantlo or his editor Marv Wolfman (most likely both) made a small mistake when they named the Burroughs in Marvel Team-Up John instead of George. John Burroughs (1837-1921) was an American naturalist famous for his essays about natural history (especially about birds). George Burroughs (ca. 1650-1692) (Don already named him that way in his comment above) was the former reverend and accused wizard of the Salem Witch Trials. He graduated at Harvard University in 1670 and became a preacher in Casco, Maine. Burrouhgs had to leave when the settlement was broken up by an Native American assault. In 1680 he moved to Salem where he worked for two years as minister (during the first year his wife died). Later Burrouhgs left Salem over a dispute with John Putman (uncle to one of Burrouhgs later accusers). He returned to Casco and once again had to leave it due to Native American attacks in 1683. He moved to Wells, Maine where he worked as a minister for nine years until he was arrested for witchcraft and returned to Salem for his trial. On August 17, 1692 Burrouhgs was hung alongside three other men and a woman. It's not clear how the Dark Rider had Mather arrive in the 20th century (the Dark Rider could have helped him, he was a Master of Time, after all). It seems like the witchhunt in Salem was fomented by Mather with the purpose to find "food" for the Dark Rider or only to cover the Dark Rider's activities in that area/period of time. I don't know if the voyage in the past of the Earth-616 heroes has spawned an alternative timestream. If so, from the Scarlet Witch arrival in Salem, this reality should be named Earth-4176. 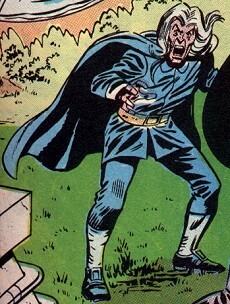 Yes...Marvel Team-Up Index declared that the Salem seen in that MTU story was that of an alternate Earth due to the time travel involved, and that therefore that was not the same Tituba as seen in Dracula Lives! I give this some credence since it is from an Official Index, but the rules of time travel are not hard and fast. They vary with author, etc. Generally, I think that it is possible to travel to the past with time machines. Sometimes actions taken by time travels can affect the past (or, more accurately, those events had actually occurred in the past, they just had not been previously revealed). Sometimes past actions actually do change the present. Most often, changes in the past diverge a new timeline. The way I see it is if the Dark Rider was revealed as the orchestrator of the Salem Witch Trials and the outcome was the same as prior to this information being revealed, it does not have to be an alternate timeline. In fact, the Dark Rider may well have traveled forward in time to 1691, so that would not have created a divergent timeline (if Captain America traveled to Earth-691 @ 3000 AD and interacted with the Guardians of the Galaxy, that would not create a divergent reality (unless it were the Guardians' past). So the Dark Rider was already there. Since the Dark Rider did not conquer the world in 1691 in Earth-616, it can be presumed that this is because he was defeated by the time-traveling heroes. I see no alternate reality evidence in this case. Earth-616 AFAIC. Every significant event potentially spawns a divergence where the events didn't happen or happened a different way. So, yes, there is an alternate Earth-4176 presumably, but that might be what if the Dark Rider conquered 17th century Earth. John Burroughs was one of the Church's Ministers in Salem Village at the time of the witchhunt. He was accused of witchcraft, but John Proctor knew he was as innocent as many other people wrongly accused. Burroughs contested the behavior and of Abigail, Betty Parris and Mary Walcott, but it was decided he had to die by hanging. The day of Burroughs' execution he recited the Lord's Prayer (something witches were thought to not be capable of doing), and many persons doubted of his guilt and they were sparing his life when Cotton Mather's claims convinced the crowd he was the Devil's incarnation. The innocent Burroughs was hanged.